The styling of this was inspired by Annapurna (who is like my lovely fairy blog mother lately--teaching me her photoshop tricks, readin' my whole blog (!? ), bein' inspirational & all around wonderful.) She let me know that the photo of this card was mysteriously missing from an old post (odd hey?) It reminded me of how fun this paper (Basic Grey Gypsy) is. 50% measures 2 & 5/8"
30% measures 1 & 6/8"
--> And she shares more punch tricks! Wow! Thank you soooo much! Your example card is stunning!! I can't wait to try these out! Oh Mel - I love it! I'm off to try! Fantastic. I printed out your butterflies on the back of dp yesterday and now have butterflies for my newest journal. Just printed the mulitple flower template. Thanks so much. You can darken your scan by increasing the contrast (makes the dark lines darker and the light places lighter). Who's been a busy bunny then?? lol. Look great Mel and oh so easy to follow!! I definitely love flower shaped cards! They are so pretty and fun to create! 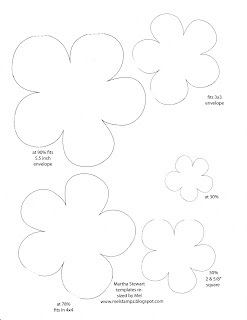 Love this template and your layered flowers look fabulous! I love the stitching too! Thanks for the links too! Your blog is a one stop place to find awesome links and tutorials!! Keep up the great work! Get OUT! That is so super-cute! YIKES! Wow! You've done it again, you wild woman!!! These are wonderful! 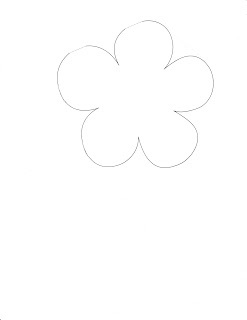 I can't wait to make a kewl flower card! Wow! Not sure how long this post took you to write, but it took me a good 20 mins to go through all the details and links that interested me. Thanks for putting this all together. Since it might be a little long I will send you email about details on how to darken your templates in photoshop. Cpeep(Carol) is right. Photoshop will make your life a little easy. I asked deb yesterday what Huglettes were and I guess she answered my question here. So far you are the second one that I read the whole blog. The other one is Deb. It is like a fast forward way of getting to know someone over the years. I'm thinking you must be a fast typist. As Usual, always amazing. I'll be cutting out flowers tonight, while watching TV with the kids. Hi Mel!! Thanks for checking out my blog!! I love this flower card, and how you used your bling!! thank you ! you do such a wonderful job at "how to's " ! Oh good, annapurna, glad you'll write out the directions for her (too much to write here!). We WILL drag Mel out of darkness into light :) whether she wants to or not! Wow Mel, love the flower template and the butterfly one is awesome too - can't wait to try them both out! I love your tutorials and am amazed at how many inspirational ideas you have to share! I just recently found your blog...I have to say WOW! I'm loving it. There is so much information here and ideas that I could just spend all my time here trying out these cool techniques. So is this your full-time job? I wonder where you get the time to do all this? Thanks for sharing the wealth! Just fab as usual Mel!! Isnt Anna great!! I hope you have a fun weekend planned. Thanks for all your wonderful comments too..
Would you mind sending my your address! to my e-mail off my blog. WOW, I LOVE the colors. It really pops!!! Great looking and awesome tut as always. At Last,,,,,I have been on here trying to leave a comment for days now. You are truley AMAZEING MEL. Thanks sooo much for all you share, you are the best. Thanks for sharing all your great ideas!! Very cute Mel! You are on quite a roll lately. I don't know how you do it all - it takes me forever to write my posts LOL! I found this template on Split Coast Stampers a long, long time ago before I really knew about the "blogging world". I'm so glad you had your blog address on the template! I posted about the card I made from your template and linked back to you. Thanks so much for the cute template! Oh, and your blog and projects are just awesome!